Herman Cain’s presidential campaign is all but over. The latest Des Moines Register poll puts his support in the critical early caucus state at just 8 percent—down 15 points from last month. Also: He’s been accused of various forms of misconduct by a bipartisan coalition of five different women, ranging from alleged sexual assault to an alleged 13-year extramarital affair, somehow managing to make Newt Gingrich look like a family man in the process. 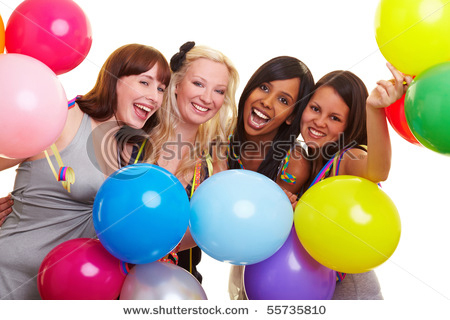 Courtesy of ShutterstockThe fact that these women can summon such enthusiasm for multicollored balloons sort of puts their energetic support for Cain in perspective. You are a triple threat to the Left!! I believe these “women” are looking for money and attention and have been groomed by the “Demonacrats” to be a bunch of bad actress’. [A]s a REAL woman I do not believe for one second any of these “women” that have crawled out from under a rock somewhere to defame you and bring pain to you and your family. They are pitiful creatures at the very least, and evil at the most. Isn’t it convenient that they have suddenly become offended by supposed advances by you now after all these years, my goodness, poor babies, how have they been able to bare up under the pain for all these oh so many years… LIARS, LIARS, LIARS…GO GET THEM HERMAN AND PLEASE DO NOT QUIT!!!! Not to quibble, but why is “women” in scare quotes? Does Cheryl know something we don’t?